On the heels of launching a series of posts about the way that a consumer-mindset hinders our missional convictions (and the way that that mindset is challenged by some wonderful people of witness--like Zach Hunter), I came across this most interesting--and possibly, to some disturbing--piece. 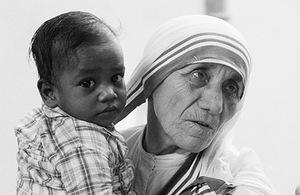 Time Magazine is running an article based on some recently released letters where Mother Teresa reveals that she had a 50-year "dark night" of the soul. It is fascinating reading that makes some nervous. As for me, I deeply appreciate it the beauty of a life lived in obedience to Christ's commands, even in the face of an experiential crisis. While it seems incongruous to so many of us who believe that Christian faith guarantees a "spiritual intimacy" with God, Mother Teresa's candor reveals a most challenging re-thinking of what faith is, offers and accomplishes, especially in our consumer-focused world. The excerpts from her letters are brutally blunt in their longing and agony. They are almost assaulting to those of us who have grown accustomed to nothing but "victorious" Christian voices. But they ring of an honesty and earthy realism that is found no less than in the Scriptures themselves. She joins a chorus of others like C.S. Lewis, St. John of the Cross, Sister Teresa of Avila and even the Lord himself whose life and faith include the absence of God. Mother Teresa reveals an often ignored reality of the Christian life: There are no guarantees of "spiritual experiences", only the trust that clings to Christ's promises, God's character and the hope of mercies that are new every morning amidst a long dark night. 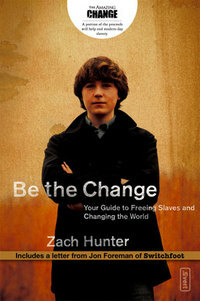 A 15-year old who is "Being the Change"
Zach Hunter is a 15-year-old abolitionist. At our High School and Junior High Summer camp, we featured his life and his book as a model for a new generation of revolutionaries. Those of us in the 25-45 year old set are inspired and heartened by this guy. I even used his story in a sermon I gave last weekend on James 5: 1-6. Please watch the video about him and let me know what you think. And then I'll tell you some about how our teenagers responded to the challenge of his life and the challenge that their response means for church leaders like me.